A Shape With Design Mode, Cool! That frightening bundle of lines on the left represents the design area. The little yellow control handles let you specify the look of the tick marks. If we pull on the handles, we change the shape of all the marks simultaneously! The faded gray version in the background shows what the shape would look like if we moved the handles to different locations. The five orthogonal crisscrossing lines serve as guides to show you the maximum size that a tick mark could occupy. The easiest way to understand is to download the Visio file and play with the shape. But if you’re enjoying a nice cup of coffee at your favorite locale, and don’t feel like proper computing right now, read on as I try and explain with pictures. If we make a wedge in the design area, then the wedges in the ring become even more…well…wedgey! But wait, there’s more! 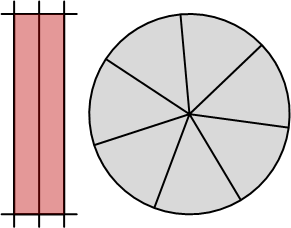 The sharp eyed reader will have noticed different numbers of wedges in the shapes shown above. That’s because there are four more features that you can control via Shape Data fields. Once you know how to control the shape, you can use it as part of more complicated shapes. 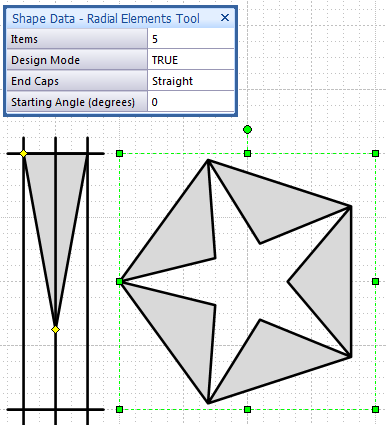 When I create shapes with the tool, I usually don’t include the shape in it’s smartened form. Instead, I use the Boolean operations under the Shape > Operations menu to create something simpler. 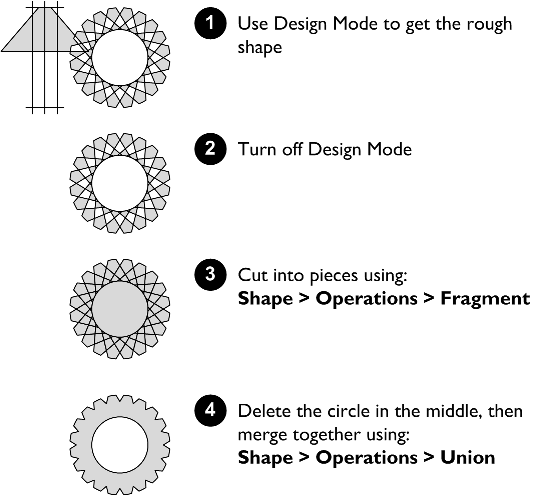 The final gear shape can’t be configured any more. It has been lobotomized–it’s smarts lost forever. But the resulting shape is neatly and accurately drawn, is compact, and is ready to become an element in a more sophisticated graphic! Ok, enough talk, here’s the download, so you can get to work! Note: because this SmartShape uses User-defined ShapeSheet Functions, it can only be used with Visio 2007 or newer! 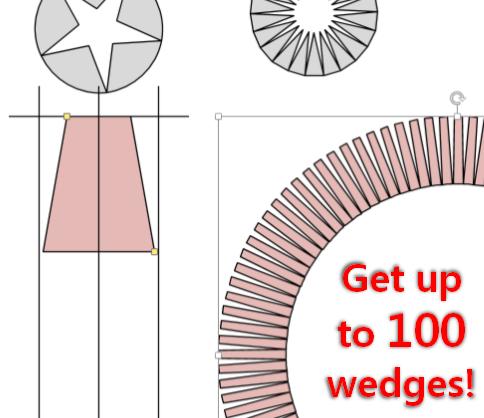 If you find the free version (with 20 wedges) very useful, but you need more, I’ve just released a for-sale version that supports up to 100 wedges. The tool works just like the free version, with the same, easy-to-use interface. 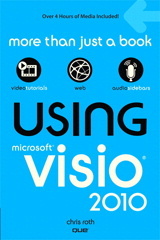 Previous Post: « Visio 2010 Beta: Sign Up Now! 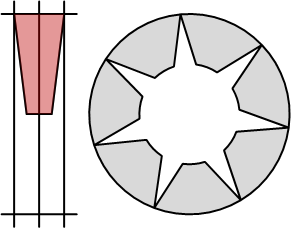 Any thought to allow user to drop a shape in the “square” and then the tool uses that shape to do the radial stuff. 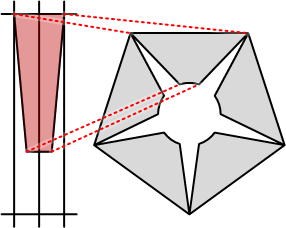 Since “square” is present and assuming drop shape would be added to the “square” group, the tool could pick up the subshape and apply and user could alter the subshape (smaller/bigger) in the “square”) and apply it to the radial stuff. Actually have a project where this might be very useful so glad this tool was created (did this manually and boy its tedious!!). Very cool shape! The “Design mode” is quite clever and I love the visual nature of its configuration. For this tool, I wanted to make something that was “shape only”, that could then be blasted by fragment and union and used in other shapes. Shapes are so much more portable than code, and no one has to trust your VBA project. But your idea is a good one. I could probably modify the Visio Network Server Shape Icon Customization Tool to get a “hot region” like you suggest. 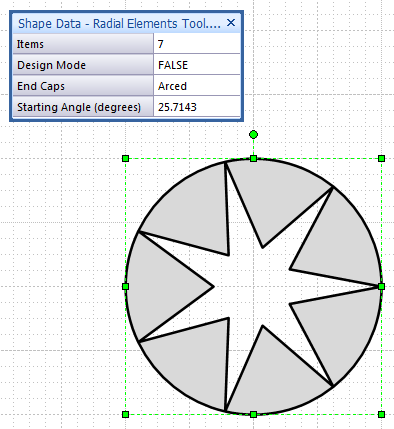 I have opened the Radial Elements Tool and I do not get the Shape Data Window item in the the View drop-down. What am I doing wrong? Right-click the shape and choose Data > Shape Data. If you don’t see these items, you might be using an older version of Visio. If so, try looking in the main menus for View > Shape Data or View > Custom Properties. You are correct, I am using 2003!!!!! This shape is magnificent! 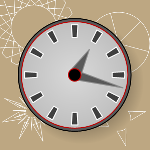 I’ve been playing with some VBS to increase the number of geometries to create calendar-like radial shapes where each geometry represents one day. I noticed that if are trying to radially distribute circle shapes, that you cannot “spoof” the shape by changing the bend setting to arc. The shapes that are generated are cool looking but asymmetric. Why the limit of 20 geometries? Can shapesheets spawn geometries without vbs using say on a user.Items_Count row? I’ve run into a paradox… Is it possible to manipulate the fill properties of geometries independently? No, a single shape can only have one combination of line and fill attributes. If you need different colors, line weights, line patterns, fill patterns, etc. then you need to group several shapes together. With code, you can generate more geometries. I think it would be interesting to come up with a generic framework and create an add-on that shapes could call with a very simple set of parameters. This would enable lots of shapes built by lots of people to have this type of capability, without a proliferation of add-ons. Hi mate thanks for this have been making circle shapes manual until now this is a big time saver. How do I gain access to this tool?? Help, Please! Click the link in the blue box? Clicking the link in the blue box takes me to the “NO Access” tab. I had to change download manager plugins, so things have been a bit haywire. I believe that this download requires that you are logged in. The old plug in told you that, the new one just gives you the weird error, what fun! So you have to have an account on this site to get this download. I’m trying to clean this all up, but I have a day job as well…sorry for the mess! I would love to use this extension, but I CANNOT download it. When I click on it my browser tells me I have NO ACCESS to it. Can you please let me know where can I download it from? Nevermind, just read I have to logon… I tried yesterday but couldn’t find how to do it. Now I did, so all clear. Sorry for the inconvenience. Thanks a ton Visio Guy! This is great, it has already saved me a lot of time. I am dealing with radial images for my research and I needed to visualize things. Drawing things by splitting the circle was too time consuming. I am working with Visio 2010 Professional. I am soooo very excited to find a tool that give me equally spaced Tick marks. It is so much harder to evenly space when you have an odd number. 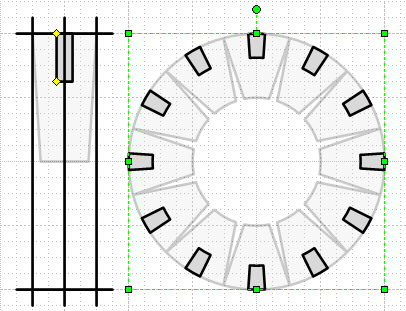 I downloaded the Radial Elements Tool and all I got was a 1 page document showing some of the things the tool can do. My ShapesData box is empty and says “No Shape Data”, What did I miss doing?? I don’t really understand your problem. The documents I provide usually show the ACTUAL SHAPES in action. So all of those examples are real Radial Elements shapes that you should be able to play with. You can drag one of the shapes onto your favorites stencil (More Shapes > My Shapes > Favorites), or any stencil for that matter, so that you have convenient, quick-access to the shape from any drawing.